The current Store-Checks are scouting jobs. That means, you can do them nearly wherever you are. And that‘s why you can‘t find these jobs on the map but in the scouting job section instead. Therefore you have to select the tab „scouting jobs“. 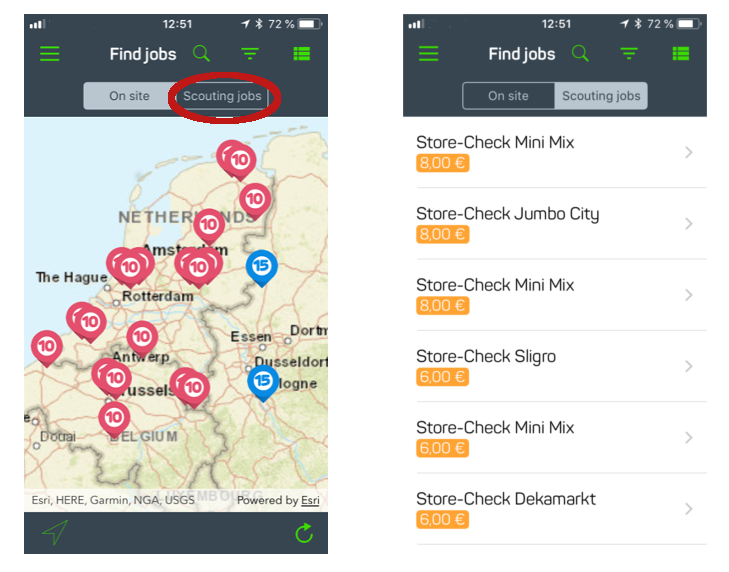 A list of all available scouting jobs in the selected area of the map will appear and you can choose one of them – for example Store-Check "Mini Mix", if there is a "Mini Mix" Market nearby. Please notice, that you can only start a scouting job when you are in the valid range of this job. Read all the tasks and hints and start your job! Have a try and you‘ll see that we have a lot of work for you. So stop reading and start working with appJobber! Good luck and have fun with our app!